The last fortnight has been a little overwhelming for me, due to previously mentioned family events. 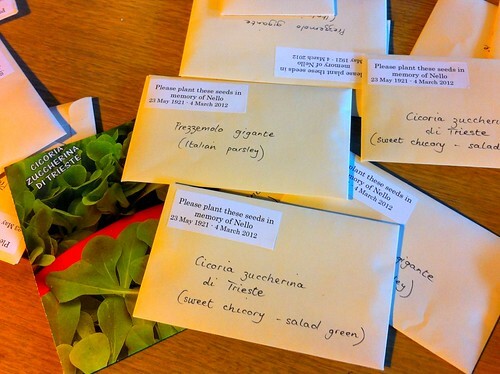 My Nonno was a keen vegetable grower, so at his funeral on Friday we gave out packets of Italian parsley seeds and chicory seeds to guests, to plant in his memory. 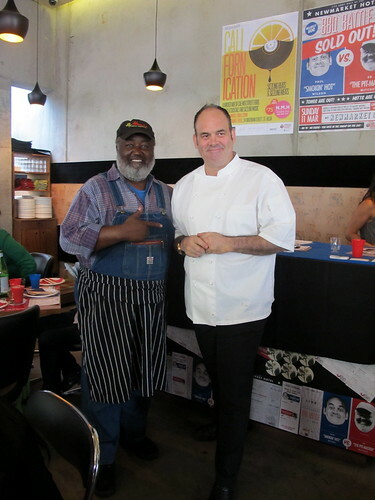 Out of necessity I cancelled attending a number of Melbourne Food and Wine Festival events, including the Sommeliers Australia Long Lunch and the audience with Bourdain. 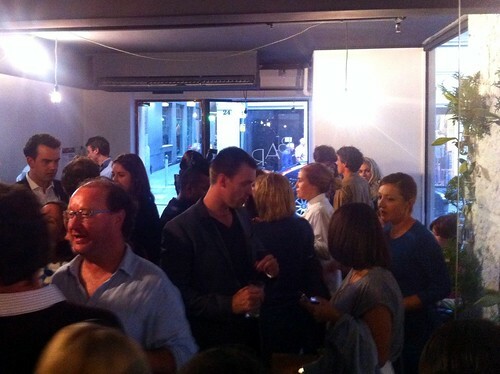 But the week before I did go to the launch party for the Broadsheet Bar (you should get down there while the Festival's still on, it's being run by the best cocktail bars in Melbourne). 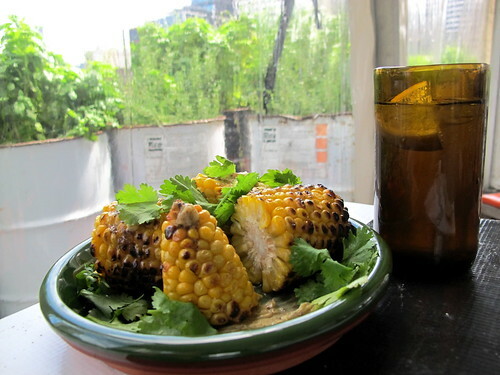 I also dropped in briefly to the Greenhouse by Joost for some grilled corn and delicious Custard Cider (also well worth a visit before the end of MFWF, if only to marvel at the building design and the sustainability/recycling principles it puts into practice). 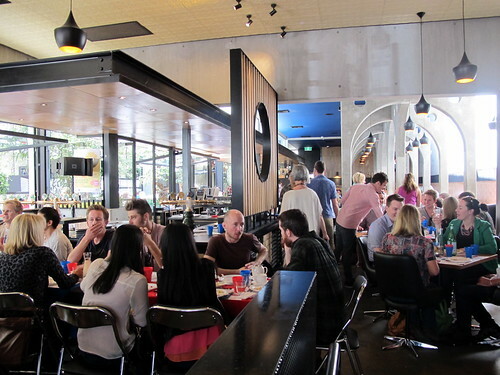 Open every day until March 21 on Queensbridge Square, Southbank. 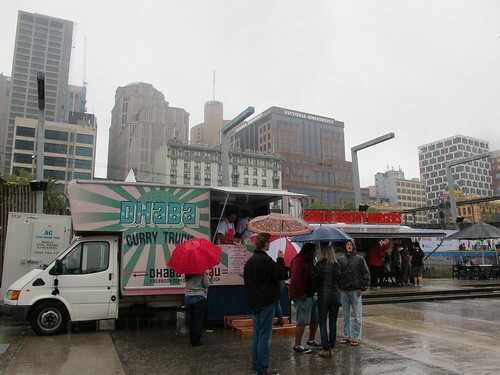 The Satuday before last I passed by the MFWF's much-hyped Food Trucks Unite event, which was unfortunately an almost total washout due to the constant, teeming rain. Luckily the weather improved for Sunday! My friend and I enjoyed the aloo tikki and butter chicken from the Dhaba curry truck (which normally resides in Kyneton). 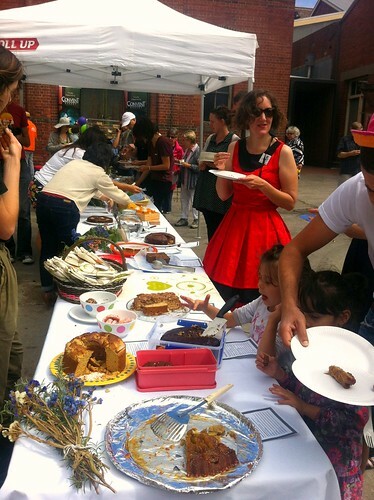 I was called upon in my Melbourne Gastronome capacity to judge the cake baking competition at the MFWF Bikefest Village Picnic on Saturday. Judging a cake competition on a brilliantly sunny afternoon may sound like a dream job to some, but let me assure you that after all the fun the resulting sugar headache was *intense*. The competition winner was a lemon and hazelnut cake, with a pear, cardamom and chai ganache coming a close second. 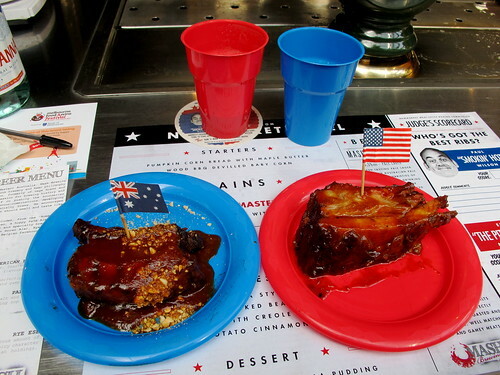 A special prize for "most ridiculous" went to a cake containing figs allegedly stolen from Tony Mokbel's garden (!). 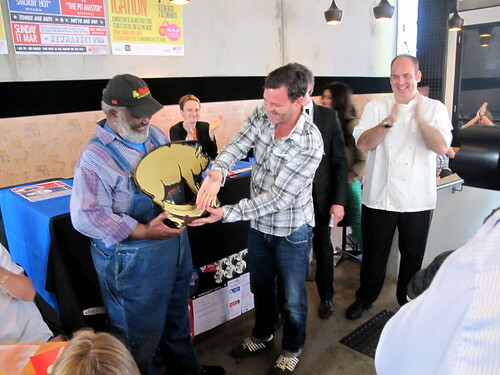 On Sunday Tom and I had a great time down at the MFWF lunch organised by Epicure at the Newmarket: a BBQ battle royale between the Newmarket's own Paul Wilson and North Carolina barbecue pitmaster Ed Mitchell. 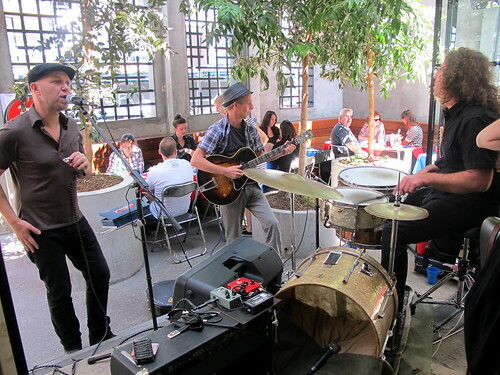 Aussie trio Collard Greens and Gravy provided the perfect swampy blues soundtrack to get us all in the mood. 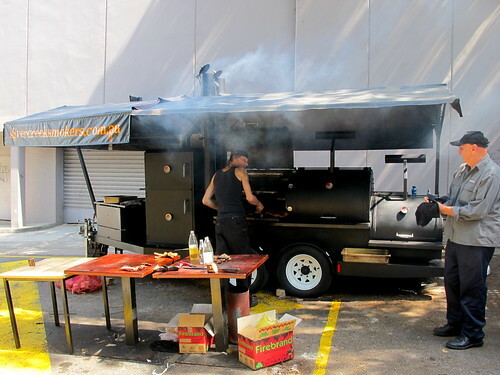 Smoker pit hardware used by Ed Mitchell during his stint in Melbourne was provided by Silver Creek Smokers (who also offer a catering/hire service for those of you wanting to run your own Southern BBQ event). 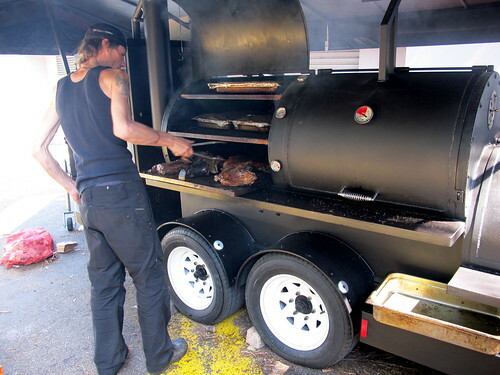 ...but in the end only one man's barbecue could reign supreme! - I love it when figs are in season. Lisa from Spicy Icecream wrote a good 13 ways with figs post the other day. 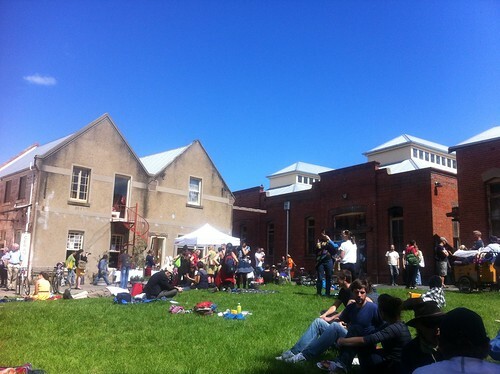 - Essjay wrote a great blog post about the MFWF incarnation of the Greenhouse by Joost. - Cara Waters (aka food blogger Gourmet Chick) wrote an article for The Age about Melbourne food bloggers working for restaurants. - Can copyright exist in a recipe, even when the ingredients have been tweaked and the method has been converted for different cooking equipment? A chef's management gets threatening in the comments on the food blog Lambs' Ears and Honey. 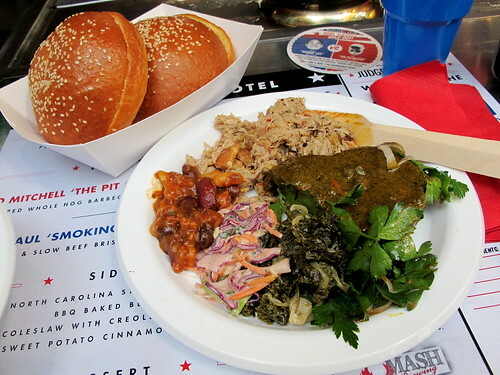 - I like The Vegan Stoner's simple approach to recipe presentation. - Thang Ngo from Sydney blog Noodlies takes food bloggers Billy and Penny on a Vietnamese Cabramatta crawl (video clips included). - Where The Truck At is a new website plotting where each of Melbourne's food trucks are on any given night. - The latest in the Stencil cafe saga. - The most recent edition of the TOYS Collective looks like it was one helluva night: see the photo gallery here. - “Kobe and the Sea”: a beautiful short film in which Ben Shewry teaches his son about abalone fishing. Its sequel "Spindrift", a short film about sustainable mussel farming, was shown at the MFWF Theatre of Ideas session on the weekend. HIPSTER EQUIVALENT OF HOOTERS?!?! DYING!! Great round-up. Ben didn't show Kobe and the Sea but another new film about the mussel fishermen in Portarlington. His wife and Kobe and other kids were in the audience though. As was his dad. In fact his dad was painting on stage. He had a potter as well and the Rooftop Honey guys. 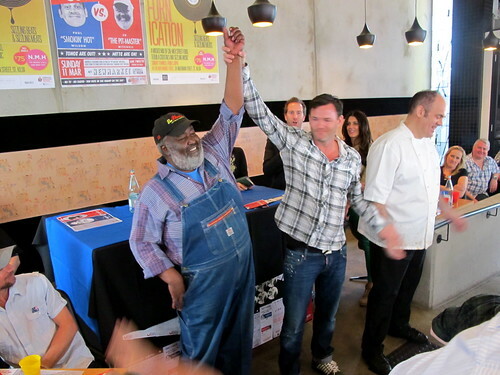 It was a very different performance and more fun than just watching some guy cook. Cheers Ed, yep as I understand it the mussel fisherman film was called Spindrift. Really sorry I wasn't able to attend to see it!